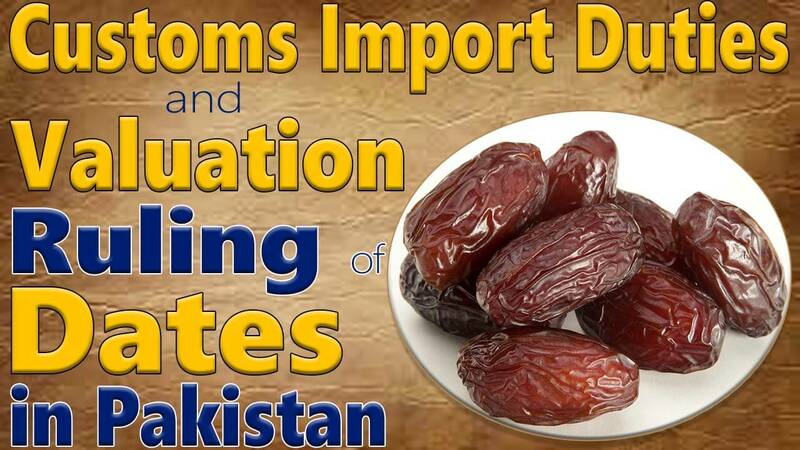 Customs Import duty on Dates in Pakistan: In this post, we share details about Customs Import duty on Dates in Pakistan, Valuation Ruling on Fresh & Dried Dates in Pakistan, Condition and Required Documents for Dates Import in Pakistan & Customs Duty Concession on Import of Dates in Pakistan. 1) Importable subject to production of aflatoxin report to the effect that the consignment is free from any pest/diseases to be certified by Department of Plant Protection, Ministry of National Food Security and Research, Govt. of Pakistan. 2) As Per Appendix B Part I Serial 13, on the import of “ALL Edible Products” Certificate of Health/fitness for human consumption from the country of Export is required. 3) As Per Appendix B Part I Serial 13, “ALL Edible Products” shall have at least 50% of shelf life. 4) As Per Appendix A Serial 5, Import of “Any Edible Products not fit for human consumption” is Banned.